If you still have questions regarding the NaLA Certified Training Program please contact [email protected]. What is the NaLA Agent Certification Program (ACP)? When did the NaLA Agent Certification Program (ACP) launch? Is the NaLA Agent Certification Program training offered in any other languages? How often does the training course need to be completed? Will each Agent receive a certificate? How much does the NaLA Agent Certification cost? Can autopay be set up for payment? What happens if the autopay fails? How does an Agent register for NaLA Agent Certification Program Training? Can an Agent register now and take the course later? What happens if an Agent doesn’t receive his/her login credentials after registration? How does an Agent update his/her contact and profile information? How, and who, identifies which ETC(s) an Agent works for? Can an Agent be Registered/Certified without being associated with an ETC? Can an Agent have multiple accounts? How many times can an Agent retake the course? How will an Agent know when it’s time to recertify? How does an Agent recertify? What happens if an Agent fails to recertify? Can an inactive account be reactivated? Can Master Agents pay on behalf of their Agents? How will ETCs or Master Agents know if their Agents have completed and passed the course? How can ETCs or Master Agents keep up with the status of their Agents? Who do we contact for troubleshooting, questions or feedback regarding the NaLA Agent Certification Program? When does the NaLA Query Tool launch? What is the NaLA Query Tool? What’s the link to the NaLA Query Tool? Who has access to the Query Tool? How does an ETC obtain a NaLA Certification ID in order to query them in the portal? How does the ACP system know an ETC’s Agent Population or base in order to calculate the percentage of agents who are Registered/Certified, as indicated by the Dashboard Pie Chart? How does an ETC know which NAP category to select when submitting a case? 1. What is the NaLA Agent Certification Program? The NaLA Agent Certification Program is designed for individual agents who currently sell Lifeline service and/or distribute phones for an ETC participating in the NaLA Agent Certification Program. The program allows agents to receive training on the federal and certain states’ Lifeline programs, and upon successful completion of the course and knowledge test, the agent will be NaLA Certified. An agent must complete the training and knowledge tests every 90 days to maintain NaLA Certification. 2. When did the NaLA Agent Certification Program (ACP) launch? The NaLA Agent Certification Program launched on Tuesday, April 24, 2018. 3. What does the training course cover? The NaLA Agent Certification Program provides a fundamental overview of the Lifeline program, including federal and state regulations, and eligibility rules and requirements. 4. Is state-specific training available? Yes. We currently have state-specific training in place for Agents in California and Oklahoma that will be automatically assigned based on the profile and contact information provided upon registration. We’re also working to produce state-specific content for additional states, which will be published at a later date. 5. Is the NaLA Agent Certification Program training offered in any other languages? 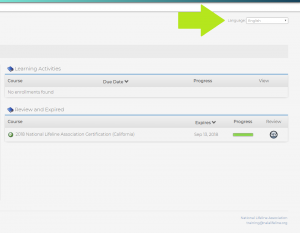 Yes, the NaLA Agent Certification Program is currently also offered in Spanish. Each Agent will select their preferred language for the training materials at registration. Then, he/she can change the system language once inside the training program — just look in the upper right-hand corner. 6. How long does the course take to complete? We understand the importance of having Agents focused on sales in the field. For that reason, we’ve designed the program so it only takes about 20 minutes to complete the course and 10-question exam. 7. How often does the training course need to be completed? The training course is structured for Agent recertification to be completed every 180 days. 8. Will each Agent receive a certificate? Yes. Once an Agent completes the training course and passes the exam, the Learning Management System will automatically generate a customized certificate of completion the Agent can download or print. 9. How much does the NaLA Agent Certification cost? Please Note: Regardless of which option is chosen, the course remains on a 180-day recertification cycle. 11. Can autopay be set up for payment? Yes. During registration, in the payment portal, an Agent can set up an autopay option from a credit card for future transactions. Agents on a monthly payment subscription are required to use autopay. 12. What happens if the autopay fails? Should an autopay fail, the system will prevent the Agent from completing the recertification course until the Agent provides a new form of payment. If autopay fails for an Agent on the monthly subscription, their current certification will be revoked. 13. How does an Agent register for NaLA Agent Certification Program Training? Agents can visit https://www.nalalifeline.org/lifeline-agent-certification/ to register for training. 14. Can an Agent register now and take the course later? Yes, however, the course registration will expire after 14 days if not completed, and the account will be disabled. Agents who register, but do not complete the training course within 90 days will be required to purchase it again if they decide to certify at a later date. 15. What happens if an Agent doesn’t receive his/her login credentials after registration? In some cases, login credentials may be sent to an Agent’s email spam folder. If an Agent doesn’t receive login credentials in a timely manner, please instruct him/her to check their spam or junk mail folder, and then contact [email protected] for further assistance, if needed. 16. How does an Agent update his/her contact and profile information? Each Agent has the ability to update his/her own profile information, at any time, by logging on to http://training.nalalifeline.org. 17. How, and who, identifies which ETC(s) an Agent works for? The Agent selects which ETC(s) he/she works for when registering for a NaLA Training account. The Agent is able to update the ETC selection at any time by logging into the training platform and updating his/her profile. 18. Can an Agent be Registered/Certified without being associated with an ETC? Initially, no. An Agent must select at least one ETC when registering for an account. However, if the Agent parts ways with the ETC, the training profile can be updated to reflect “Unincorporated” as the ETC until the Agent onboards with another ETC. 19. Can an Agent have multiple accounts? No. Each individual Agent is permitted to have only one account regardless of the number of ETCs he/she is associated with. Our system has processes in place to identify duplicate attempts based on profile information provided by the Agent. 20. How many times can an Agent retake the course? The Agent can retake the course and exam as many times as needed in order to pass. There are no restrictions on the number of attempts allowed. 21. How will an Agent know when it’s time to recertify? Upon completion of the initial training course, the Learning Management System will track the recertification dates for each Agent automatically. The Agent will receive reminders via email at 7 days, 3 days, and 1 day leading up to the recertification date. Not sure how to recertify? Click here for step-by-step directions. 22. How does an Agent recertify? View this step-by-step-tutorial that explains how to recertify NaLA Lifeline Training, or click here to get started on the Agent Certification Program. 23. What happens if an Agent fails to recertify? If an Agent does not complete recertification by the 180-day due date, he/she will be granted a 14-day grace period. If the Agent does not recertify within the 14 days the Agent’s NaLA account will be deactivated. Email reminders will be sent to the Agent within the grace period, alerting him/her of pending deactivation if he/she fails to recertify. 24. Can an inactive account be reactivated? Yes. In order to reactivate an account the Agent can contact [email protected], and the administrator can review and facilitate the request. 25. Can Master Agents pay on behalf of their Agents? Yes. An ETC or Master Agent can prepay for Agents for the 6-month or annual payment plans in bulk using the following process. This process does not apply to monthly payment plans. Once the payment has been completed, the system will automatically generate a coupon code. The ETC or Master Agent then distributes the coupon codes to the Agents to use when they register for an account on the NaLA website. You can view a step-by-step guide on NaLA ACP bulk purchasing here. Coupon codes are tied to the number of Agents/users whose certifications were paid for. The codes are good for a single use per Agent only. It is recommended that each ETC or Master Agent keep close track of the coupons they hand out. Once it has reached its capacity, the coupon code will automatically expire. ETCs or Master Agents are paying for individuals, not a number of seats. Each individual Agent must have his/her own paid account. Generic accounts will not be permitted. Refunds will not be issued on coupon purchases. Coupon codes are not available for customers on a monthly payment plan. 26. How will ETCs or Master Agents know if their Agents have completed and passed the course? Each Agent will need to notify their ETC or Master Agent when he/she has completed training. That may also include sending the ETC or Master Agent a copy of the course completion certificate. 27. How can ETCs or Master Agents keep up with the status of their Agents? Each participating ETC or Master Agent can designate administrators to be provided with access to the NaLA Query Tool. Please see the Query Tool FAQs below for more information. 28. Who do we contact for troubleshooting, questions or feedback regarding the NaLA Agent Certification Program? For any troubleshooting issues, questions or feedback please email [email protected] The administrator will review and respond as quickly as possible during normal business hours Monday through Friday 8 AM ET to 5 PM ET. Please allow up to one business day for a response. 1. When does the NaLA Query Tool launch? The tool will be available for ETCs as of November 1, 2018. 2. What is the NaLA Query Tool? 3. What’s the link to the NaLA Query Tool? 4. Who has access to the Query Tool? Only ETC Owners and designated admins from each ETC have access to the tool at this time. 5. How does an ETC obtain a NaLA Certification ID in order to query them in the portal? The agent can provide the ETC with their NaLA Course Completion Certificate, which can be found on the agent’s profile in the training system. A designated ETC Admin can go to the Reporting section of the NaLA Query Tool and run a report of all the agents assigned to their ETC, which includes Certification IDs. 6. How does the ACP system know an ETC’s Agent Population or base in order to calculate the percentage of agents who are Registered/Certified, as indicated by the Dashboard Pie Chart? This calculation is based on the number of agents who select an ETC in their NaLA profile. The system then calculates the percentage of those agents that are currently certified. 7. How does an ETC know which NAP category to select when submitting a case? NaLA has created a document that explains the NAP categories and example scenarios. Questions? Contact the NaLA Training Department at [email protected].